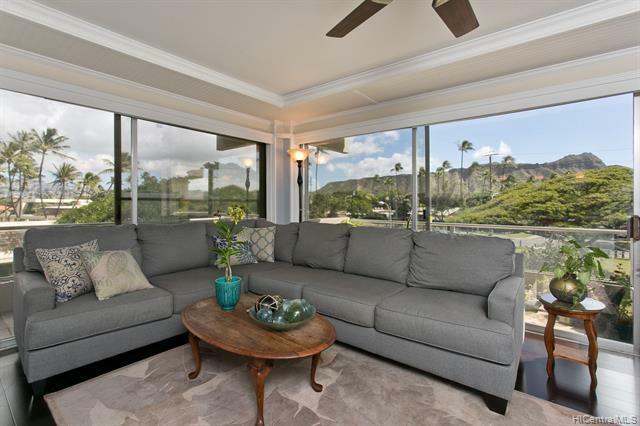 Picture perfect Diamond Head views from this rarely available 2 bedroom, 2 full bath, breezy, corner unit in Parkview. This boutique condominium is located on a quiet could-de-sac across from the zoo, has an open kitchen with eat-in counter seating, two lanais with open vista views, beautifully upgraded finishes, swimming pool, assigned covered parking and storage locker. Enjoy the quieter side of Waikiki, yet still just minutes from world famous Waikiki beach, restaurants and shopping. Enjoy the farmer's market, catch a concert or art exhibit, play tennis or jog all at the park right outside your front door. Live the Hawaii lifestyle only two blocks from the ocean or rent it out. Well maintained and secured building with an on site manager. New water heater. Listings provided courtesy of Oahu Land Company.